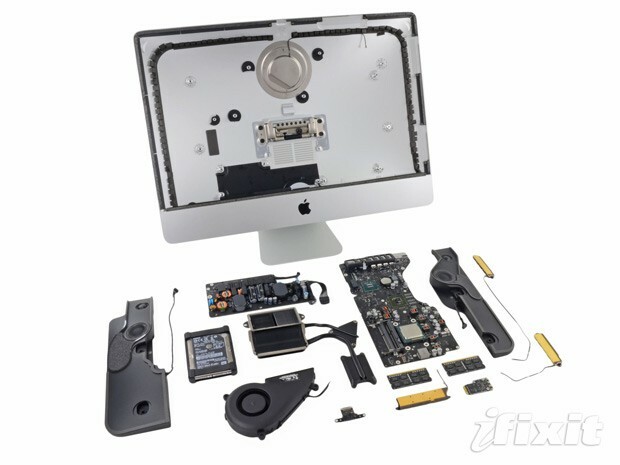 We got an early teardown of the latest 21,5-inch iMac thanks Japanese site Kodawarisan, but now it's had the full iFixit treatment. The overall verdict? Well iFixit weren't overly enthused with some of the new design's internal fixings, making a special reference to the use of glue to bind the LCD and glass to the rest of the frame, instead of magnets as found in previous models. Likewise, those two major components are now fused together meaning if you want to replace one, you'll be replacing the other too. This adhesive also contributes to the trickiness of general repair. Beyond the glue-based concerns, there's the usual intense poring over of internal like the dual mics found at the rear, or the 2.5-inch HGST / Western Digital hard drive. Overall, though, the tone is a definite thumbs down when it comes to repairability, with the device getting just 3 out of 10 on it's now famous meter. Prise open the source link for the full internal tour.